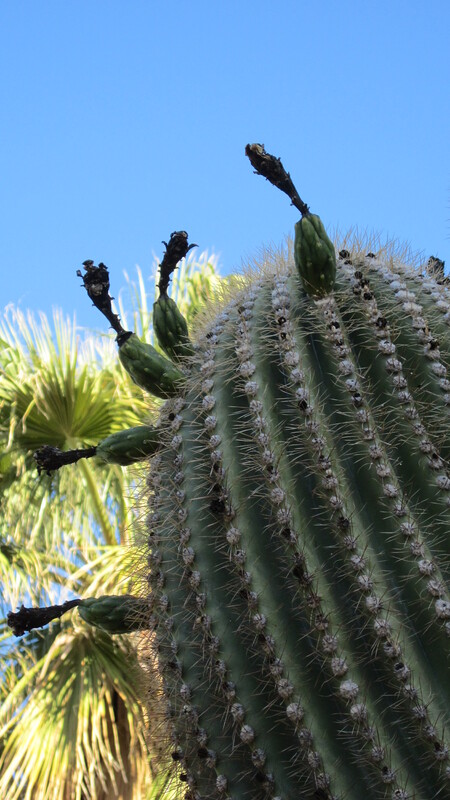 The saguaro fruit have set and will be ripening over the next three or four weeks. The skinny little fruit in the photo above will grow fatter and the insides will turn red, juicy and sweet. Occasionally you’ll see something that looks like a red flower, but that is just a fruit that has ripened and opened. The red is the inside of the exterior rind stained red by the ripe fruit. Imagine that you were a Tohono O’odham living on the Sonoran Desert 200 years ago. Human beings from the dawn of time have loved sweet things, but you haven’t had anything sweet since the prickly pears last fall. Oh, maybe a little bit of honey snatched at great peril from some bees. Saguaro juice is deliciously sweet. It’s also getting very hot and it hasn’t rained for many weeks. In the mornings you might do some work getting your small field ready to plant a little corn and some tepary beans once the rains start. In the afternoon, you seek the shade. Even those of us who can wait out June in air-conditioned comfort still look forward to the coming monsoons. And the saguaro harvest.